Whether your home or business is vinyl, cedar, brick, stucco, or literally any surface, our low pressure soft washing methods eliminate mildew dots, green algae, streaks, cobwebs, and dirt off the surface, leaving a beautiful shine! 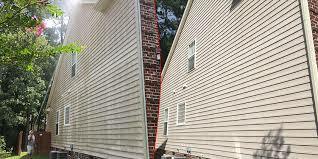 Low pressure soft washing is the way to go due to its amazing abilities to kill all the grime and actually restore surfaces to their original color and state. Unlike power washing or pressure washing, our soft house washing will not damage the exterior and risk blasting water into the building. Your ear-to-ear smile after seeing your exterior safely shine as if it is brand new is what makes us proud to offer you low pressure house washing!